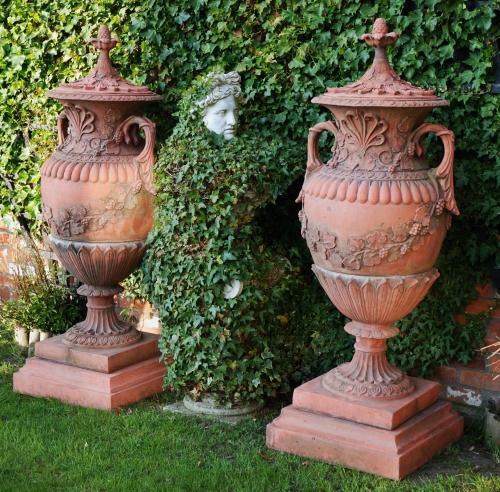 A mid 20thc large decorative pair of terracotta composition garden urns with circular detachable lids. The lids are decorated with acorn finials and vine leaves. These lead down to the main body of the urns decorated with swags of vine leaves and grapes with foliage handles. These urns could be either siuated inside, maybe in a conservatory of orangery or equally would be very decorative pieces outside in a garden. These pieces are each in four sections to make moving them easier. Each section can be moved fairly easily by two strong people.